This year, for something different, we planted yellow squash instead of zucchini in our garden. If you've ever grown either variety, I'm sure you know what it's like to have an abundance of zucchini and the trials of what to do with them. 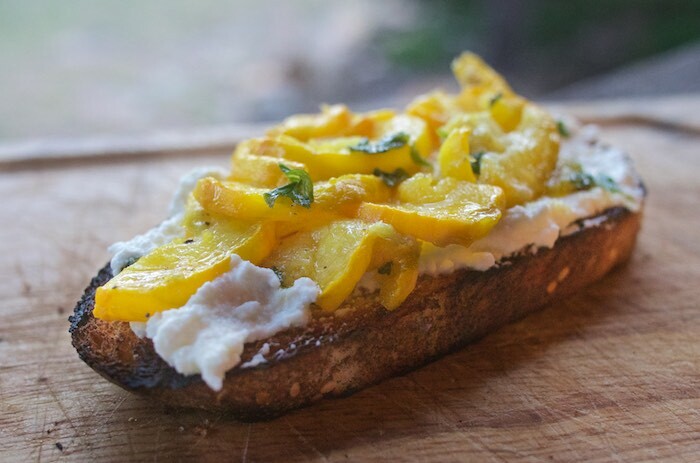 One of my favorite ways to serve squash is with some ricotta cheese, as a bruschetta topping. For added flavor I will often saute them in either homemade basil or mint oil. Spread bread with a thin layer of ricotta cheese and top with a generous helping of sauteed zucchini. Heat olive oil in a saute pan. Add chopped fresh basil or mint and allow oil to come to a boil. Once it starts to boil remove pan from the heat and allow it to cool before using. I also planted the yellow variety this year, and this looks like a delicious way to use some of them! I just started a garden this year and next year would like to grow zucchini and squash. I like to have butternut squash with ricotta. So good! I don't see yellow varieties very often, but I must seek it out. it looks great and sounds so delicious in this recipe. Oh this looks delicious! I love veggies served in a creative way like this! Yum!